The last talk of the year 2018 is with - Snow-Monster - a very interesting and inspiring talk, well worth the longer read! Hi! I'm a self-taught traditional artist from the American Rocky Mountains. I've developed a love of classical literature, an appreciation for early American history, a keen interest in film and movies, and a passion for ice hockey to name a few of my interests. My work entertains an interest in discovering a sense of wonder through the natural world around us and the richness of the imagination. My hope is to develop my artistic talents further and eventually become a storybook illustrator. I was really into superheroes as a teen especially the Marvel characters shortly before the MCU movies were made. I found this Captain America redesign by DavidFernandezArt and was immediately hooked. As for my username, my first online account was made for a few hockey jersey concept sites which I frequented and submitted designs to. My favorite hockey team being the Colorado Avalanche, I used their first mascot, Howler the Yeti, as inspiration; a snow monster. At the time, I joined deviantart to primarily feature some hockey team logos I redesigned. It was only later that I decided to focus more on my sketches. I've pretty much stuck with the username ever since. Hockey and superheroes are not really topics leading to Middle-earth How did you enter Tolkien's world for the first time, and what impression did it leave in you? I first entered the world of Tolkien when I was eight years old. My mom gave me a copy of The Hobbit and I enjoyed the first few chapters, but it wasn't until I got to the Riddles in the Dark that I really got hooked on the world Middle-earth. Needless to say, once I finished the Hobbit I dove into the first copy of the Lord of the Rings that I could get my hands on. I received the Silmarillion for Christmas after that and have been collecting Tolkien's writings ever since, so it's safe to say that the impression was a lasting one. So you was not even 10 when you read the Silmarillion, do I understand that correctly? Wasn't it too hard to read for you then? That's right. I admit it was a challenge for me to read at the time, it may have been beyond my years, but I still found a good deal to appreciate. Even though I didn't fully comprehend the entire account I could recognize the truth and beauty conveyed by Tolkien in his writings. It has taken me several re-readings, but I have found so much to discover and think about in the Silmarillion largely, I believe, because it is relatively untouched by pop culture and modern media and therefore more open to the imagination. 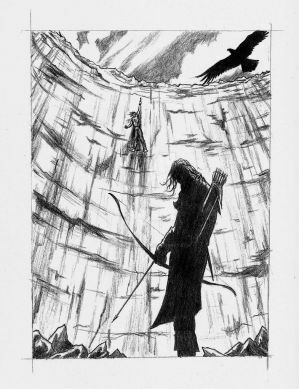 I still find the chapter the Lay of Beleriand difficult, but the tales of the war of the jewels are spectacular, somber, and genuinely inspiring. That's what I found mesmerizing as a boy. What creates the image of Middle-earth in your mind? Is it more influenced by the books or movies, or maybe other artists, and did it change over time or remained the same? My primary point of inspiration comes from the books. Tolkien was a master of language and his creativity, or sub-creativity in this case, is astonishingly rich, yet he leaves just enough room for the imagination of the reader to fill in the minute details. I read the books before Peter Jackson's films were released so I had already formed an idea of what Middle-earth looked like. The movies did provide a better sense of scale and the greater scope of Arda than what I originally imagined, so the movies lend some inspiration indirectly, but I tend to avoid any direct reference to the fine work that Weta workshop has done. I won't quite go so far as to say that I'm a purist, I do like many things about the movies and think they are a cinematic achievement, but there are a ton of things that they either changed or left out and not all were for the better. 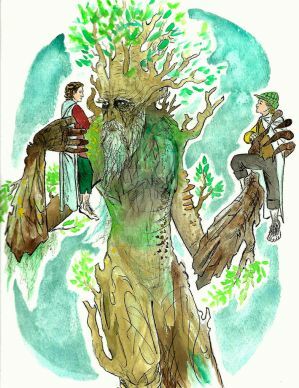 I do enjoy seeing what other artists come up with in depicting Tolkien's world, but they rarely inspire me in my own work. My vision of Middle-earth has changed over time. Not drastically, but each time I read one of Tolkien's books I pick up on details that I missed previously or had forgotten and, in a way, that's one of the great things about Middle-earth; there's always more to discover whether it's linguistic, historical, literary, or something else entirely. Speaking about Tolkien's books, you said you have been collecting them. How extensive is your collection now? Well, aside from the books I received as a kid, my wife and I have been giving Tolkien books to each other almost since we met. Between the two of us we have three copies of the Silmarillion (one of which is a first American edition), several copies of the Lord of the Rings, a couple of The Hobbit, The Children of Hurin, The Lay of Luthien, and most recently The Fall of Gondolin in addition to The Unfinished Tales, The Lost Road and Other Writings, The Book of Lost Tales 1 & 2, Tales from the Perilous Realm, The Lays of Beleriand, Tree and Leaf, Beowulf, Sigurd and Gudrun, The Fall of Arthur, Sir Gawain and the Green Knight, The Letters of J.R.R.Tolkien, as well as The Tolkien Reader, a few commentaries, and companions. I haven't collected all volumes of the Histories of Middle-earth, but there lie a few opportunities for future birthday and Christmas gifts. though it is not his appointed mission, the one who carries on and endangers his own life to save Frodo. He preserves the hope that the Ring can be destroyed so that the world may be made new again. 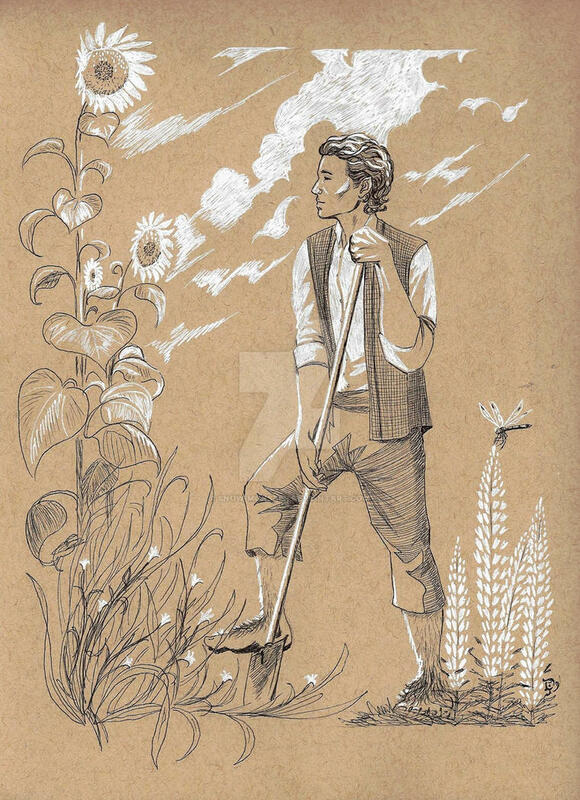 In one letter Tolkien once wrote that, “The Sam Gamgee of my story is a most heroic character, now widely beloved by many readers,even though his origins are rustic.” He added to this thought in a separate correspondence to his publisher, Milton Waldman: “I think the simple “rustic” love of Sam and his Rosie (nowhere elaborated) is absolutely essential to the study of his (the chief hero’s)character, and to the theme of the relation of ordinary life (breathing, eating, working, begetting) and quests, sacrifice, causes, and the “longing for Elves”, and sheer beauty.” Sam shares a deep and inextricable connection to the common life. Everything about his existence that he holds dear is the very thing which the heroes defend and without which there can be no heroes. It is because Sam is in such close association with these simple and everyday things that his noble efforts raise him to the high standard as the chief hero of The Lord of the Rings. Although Faramir is a pretty great guy too. 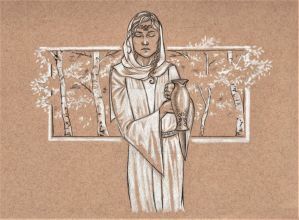 Are there also some topics in Tolkien's works that you are particularly passionate about? Given that Tolkien covered wholesome themes such as sacrifice, adventure, and causes (even if they are lost causes) in his books I can only grow in appreciation for them after every read. They made such an impression on me that I was motivated to delve into them even further while I was in college basing my junior project and senior thesis on the long defeat and heroism through Tolkien's works. I'm sure I could go on forever on themes in Middle-earth, but I'll touch on my three favorites: the long defeat, hope, and heroism. Tolkien frequently wrote on, what he called, the long defeat. Often indirectly, but sometimes, like in the fellowship's sojourn in Lothlorien, he addresses it head-on. The lady Galadriel first mentions this concept to Frodo. Through her, and in many of his other writings, Tolkien eloquently conveys to us that life is full of hardships and that no happiness is on earth is lasting. Difficulties and even sorrow will enter our lives again and again no matter how hard we work to avoid them. But his is not a defeatist mentality, rather it is a sober one and one which realizes that evil, though relentless and unforgiving, will not be the one to ultimately claim the final victory. Hope is probably the most predominant theme throughout the Lord of the Rings and is certainly the most important. Hope is what propels the fellowship forward through their journeys and towards their destinies. Hope is what inspires each of them to fight for their friends, peoples, and their homelands even if it means they will not live to see the world renewed. It remains a powerful and timeless quality that enriches the story and compels audiences worldwide to aspire to find it in their own lives. As Bilbo Baggins once said: "Where there's life, there's hope." Finally, the acts heroism displayed in Tolkien's Middle-earth are undeniably worthy of immitation. Even if they are fictional characters one can only admire the leadership of Aragorn, the courage of Borimir, the persistence of Frodo, the loyalty of Sam and the honor of Faramir (just to name a few). All exhibit some form of skill coupled with self-sacrifice. Men who display extraordinary talent and bravery have sparked legends, myths, sagas, epics, faery stories, and romances for countless generations, but Tolkien rooted his heroes in aspects of the finest characters of antiquity and developed them even further by clearly illustrating that heroism comes not from one's own efforts, but by putting the well-being of others before one's own and that this act of selflessness is done so that a greater good may come into being. Did Tolkien's writing influence your own life with its values then? Indirectly perhaps, but I believe the values presented in Tolkien's sub-creation reinforced the ethics that I was bright up through my parents. Once I grew up and reexamined those principles I found that not only were those morals still sound, but they complimented the writings of many classic philosophers as well as my own convictions. Now, let's talk about art. You already said you are a self-taught artist who would like to become a storybook illustrator. What brought you to art and who or what influenced your style? I've been drawing ever since I can remember. I believe I starting drawing dinosaurs when I was a toddler (still do) and have kept up with it ever since. In my early teens I started to refine my approach and was drawn to some comic book art. I enjoyed seeing so many different approaches in depicting the same character. Captain America and Batman could be interpreted in a plethora of styles and I started to mimic select aspects in my own work. Comic book artists Jim Lee, Brian Hitch, and especially AdamHughes influenced me the most. However I've also found inspiration outside the superhero world in Michaelangelo, William Adolph Bouguereau, and Arthur Rackam from the classical side. Being a Tolkien fan, it's near impossible not to like the peices by Alan Lee and John Howe. I don't always love their interpretation of Middle-earth and it's inhabitants, but I do like their techniques and artistic approaches. Finally, Drew Struzan is also a favorite of mine especially with his movie posters. All of these artists have a sort of stylized realism in their art and that has greatly influenced my own work in some form or another. What's your creative process from picking the theme to finishing a picture? Once I have the image in my mind, I sketch a few thumbnails to try out different angles and placements. Then I try to decide what medium fits the scene: graphite, ink, colored pencils, markers, watercolors, sepia tones, black and white...etc. Usually the more colorful the picture, the more cheerful the scene and vice versa, but not always. Then I try to figure out the values and contrast and then get down to work with an underlying pencil sketch and work over that. Finally I'll scan the peice and touch it up with a photo editor program just to bring out the highlights and color. And before you have an image in mind? How do you decide which scenes or characters you are going to draw? That's a little harder to explain.Tolkien's work is so descriptive that I could probably draw something from every page of his books (and almost certainly would if I had the time), but some visuals come more readily than others. In a way the artwork allows me to convey what I see or feel in a manner that can be recognized by others. I suppose I try to depict something that is striking through power or beauty or something that triggers an emotional response. The same pretty much goes for non Tolkien related work as well. There are a number of advantages to any technique. Ink is sharp and precise, markers are faster and cover more surface area, and paint looks more professional. However, I still prefer old fashioned pencil. Traditional techniques are what I'm familiar with, but there are many more that I haven't tried yet, acrillic for example. One day though, I would like to make the jump to digital in Photoshop and Illustrator. Do you have some tips and tricks you would like to share with the other artists? I've always found that I've improved by watching how other artists do their work. Different techniques, styles, and approaches have helped me immensely. Lots of experimenting too. It was a wedding present to my wife a few months ago and was certainly the largest and most intricate artistic endeavor I have undertaken. 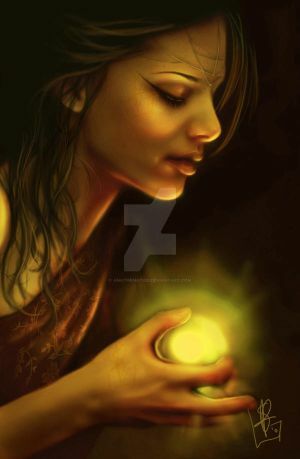 I chose The Houses of Healing since it is one of her favorite chapters in the Lord of the Rings. While it's not perfect, she was very happy with it, so I'm satisfied. I suppose this qualifies as my favorite picture from another "fandom." One of my earlier works, it is taken from a scene in Homer's Illiad. 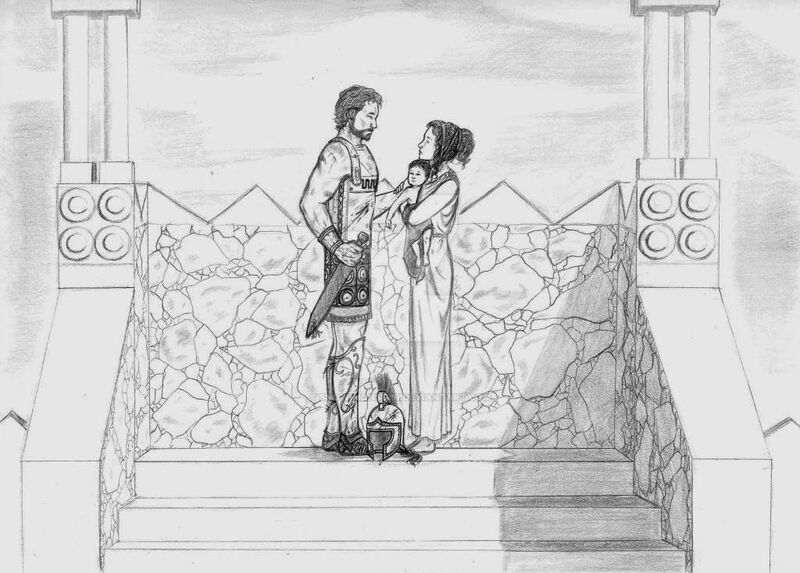 This scene stood out to me, during my first reading of the Greek epic, as one of the most touching chapters as the warrior prince Hector bids his wife and son farewell before his death. 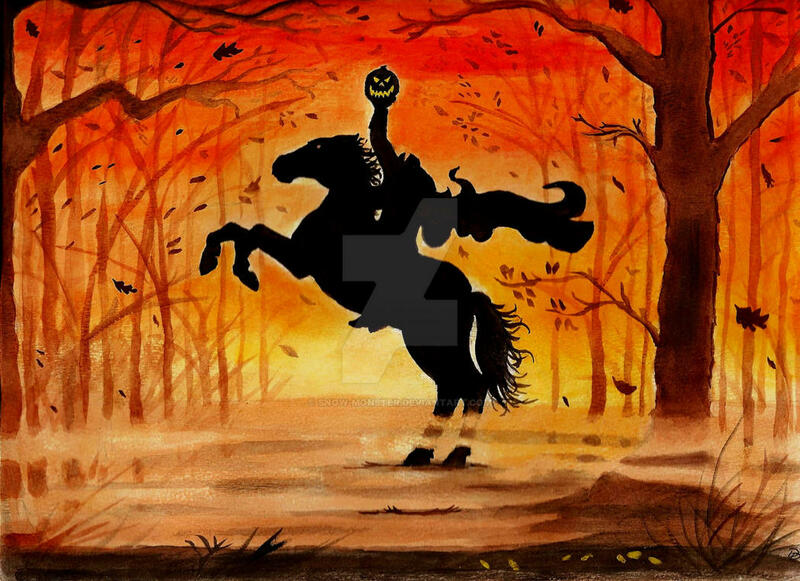 Although I'm pretty pleased with this painting from the Legend of Sleepy Hollow too. This one is probably the closest. 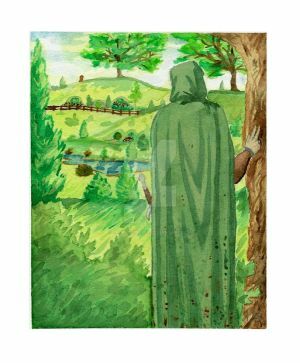 Aside from the Houses of Healing piece, Watching Over the Shire proved to be the most challenging. 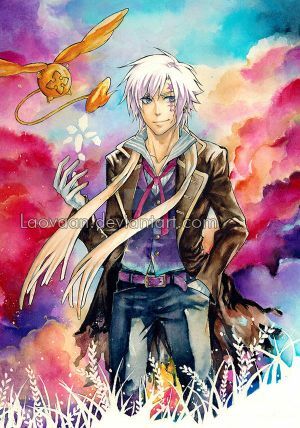 At the time, I was pretty new to watercolors so this took some trial and error to get close to what I envisioned. It was fun to become more proficient in painting, but it took a lot of work. mostly because it turned out so unexpectedly well and it's one of my favorite ink works. 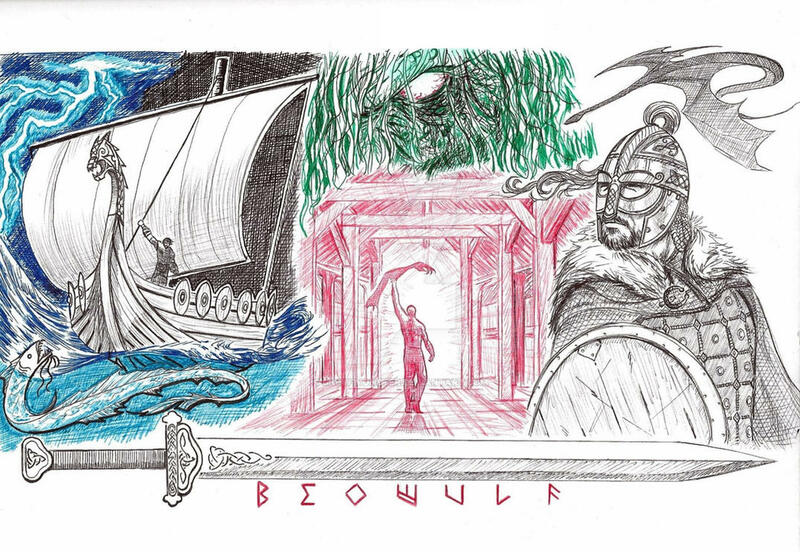 The poem proved to be very influential to Tolkien in his writings and it stands as a great work of art on its own. 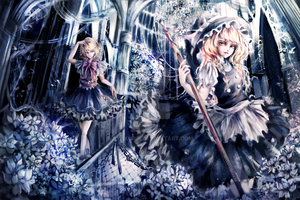 Plus I'd like to include this other piece I did this past Halloween since it hasn't gotten much exposure. I have found may sources of inspiration throughout my life, but none more invaluable than my wife who has gently pushed me when needed, sparked many great concepts for me to tackle artistically, and patiently endured Inktober. 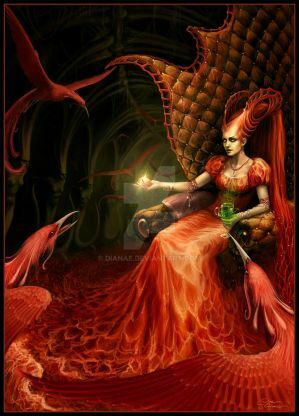 I am also grateful for those in the DA realm who have taken the time to comment, offered feedback, and watched my work. It has been both humbling and encouraging to receive the kind of responce the users of Deviantart have given me. And thank you for offering the interview. You are welcome! So you took part in Inktober? What was your experience with it? Would you recommend it? I participated in Inktober for the first time this past autumn. I've been aware of it for a coupe years now, but for one reason or another never tried it till this year. It was certainly a challenge. The first week or so was a blast, but it did get a little tedious especially when I missed a day or two and had to play catch-up. I'm glad I stuck with it though, it did help me improve my drawing skills and bettered my spontaneous approach when it comes to art. I'll try to post my Inktober work on here one of these days. I would recommend to artists to try it at least once. I'm sure it'll help some more than others, but I can definitely say I've improved because of it and I think many others will too. Sure! 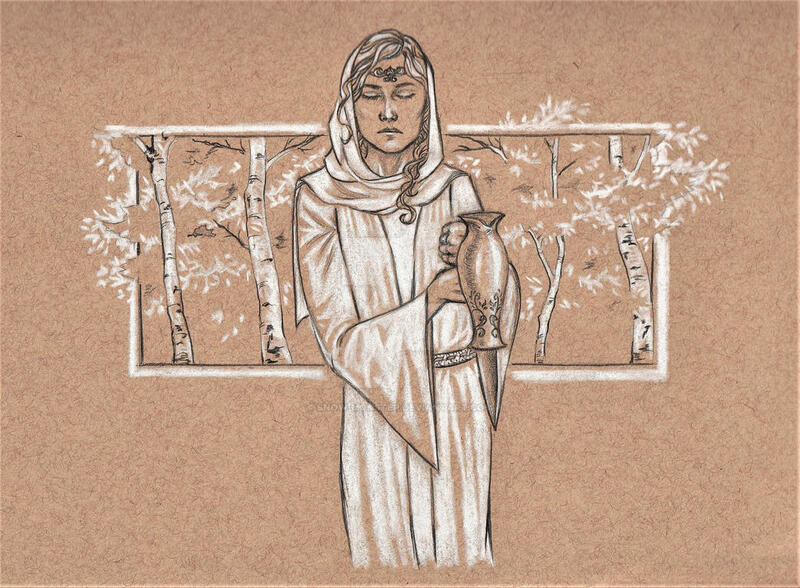 There are a couple of artists I've encountered here who have displayed some good work, are also Tolkien fans, and who have not yet been interviewed by you. Here are couple by Wyglaff. For anyone who's a Tolkien fan, I believe it is imperative that one tries to truly understand what the professor was conveying in his writings rather than inserting what one wishes was written or reinterpreting his work. It may take more effort to uncover the hidden meaning, but far too often I come across fan art that has little to nothing to do with what Tolkien had in mind. 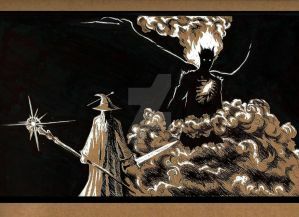 I won't go so far as to say that I'm a purist, but it is important to respect the source material since we would not be able to enjoy the world of Arda and beyond without the singular vision of J.R.R.Tolkien. As for anyone who finds my work enjoyable, it is deeply satisfying to know that I have made an impression and I welcome any future feedback. Many thanks. It's an honour to be mentioned by someone who knows what he's talking about AND who has developed his own distinct (and may I say pretty powerful) imagery of Tolkien's world. Thank you for the kind words! I'm very flattered. Brought to Life: Nintendo CosplayNintendo defined so many of our childhoods. It's a fun thing to see all of the characters we grew up with come to life, with the effort of these fantastic cosplayers. 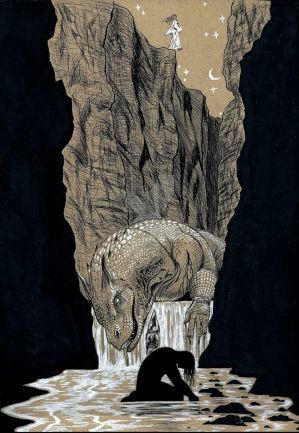 Talks with Tolkien artists: Snow-MonsterThe last talk of the year 2018 is with :iconsnow-monster: - Snow-Monster - a very interesting and inspiring talk, well worth the longer read!